Recombinant fragment corresponding to Mouse p75 NGF Receptor aa 43-161 (extracellular). WB: NIH/3T3 and WiDr cell lysate. Flow Cyt: Mouse neuroblastoma and rat glioma cells. Our Abpromise guarantee covers the use of ab8874 in the following tested applications. Western blot - Anti-p75 NGF Receptor antibody (ab8874)This image is courtesy of an anonymous Abreview. NG108-15 cells, a fusion of mouse neuroblastoma and rat glioma cells, were used for a FACS analysis. Cells were incubated for one hour with Ab8874 at a 1:100 dilution, and subsequently with an anti-rabbit IgG conjugated to FITC. A 96% shift was seen relative to control cells treated with secondary antibody only. (note; yellow = control, red = result). Western blot - Anti-p75 NGF Receptor antibody (ab8874)Image courtesy of an anonymous Abreview. Publishing research using ab8874? Please let us know so that we can cite the reference in this datasheet. ab8874 was raised against a synthetic peptide containing a GST tag. However, ab8875 is the immunogen affinity purified version of ab8874 and was purified to remove all antibody that recognizes the GST tag, so only antibody recognizing p75 NGF receptor remains. I'm using this ab8875 in IHC-Fr and seeing staining in my mouse sections, but not human. I would like a replacement with ab8874. I am sorry this product did not perform as stated on the datasheet and for the inconvenience this has caused. As requested, I have issued a free of charge replacement of ab8874with the order number 1151618. Inquiry: What is the concentration of the p75 NTR antibody (ab8874)? It is not stated on the website. I can confirm that ab8874 Anti-p75 NGF Receptor antibody is sold as whole antiserum. Unpurified antibodies, such as those sold as whole antiserum, ascites or tissue culture supernatant will not have a concentration stated on the datasheet. Antibody concentration is usually determined by protein assay, and serum will contain a lot of other proteins, which means the antibody quantification would not be accurate. I can confirm that for whole antiserum, concentration of antibody is known to very between 1 -5mg/ml. We used ab8874 to stain the live cells of neurosphere which was primary cultured from human bowl tissue by FACS. But they are always same with the negative control. Would you advise me which protocol do you use to get the positive staining result on your data sheet by flow cytometry? We used the same antibody to do frozen section staining and got more than 80% positive. Thank you for contacting us. I am sorry to hear that you are experiencing problems with this antibody. The FACS protocol we have used for this antibody is very simple. Please find attached the document. Called to inquire about positive control for IHC-P.
TThank you for calling Abcam regarding positive controls. 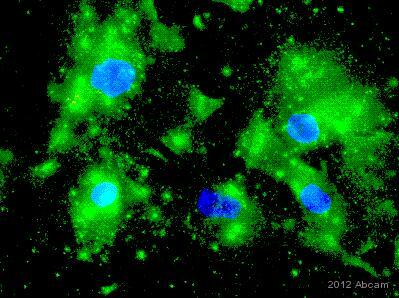 AB10404 has been used in IHC-P on lung sections in the following publication:Liu Yet al.Human metapneumovirus establishes persistent infection in the lungs of mice and is reactivated by glucocorticoid treatment.J Virol83:6837-48 (2009).http://www.ncbi.nlm.nih.gov/entrez/query.fcgi?cmd=Retrieve&db=PubMed&list_uids=19357175&dopt=Abstract. In regards to AB8874: The publication,Liu Set al.Cross-talk between Schwann cells and neuroblasts influences the biology of neuroblastoma xenografts.Am J Pathol166:891-900 (2005).http://www.ncbi.nlm.nih.gov/entrez/query.fcgi?cmd=Retrieve&db=PubMed&list_uids=15743800&dopt=Abstract,uses human schwannoma as a positive control for anti-human p75NGFRantibody. I hope that this information is helpful. Please let me know if you have any questions. I use ab8874 as specific first antibody to separate Schwann cells from mouse sciatic nerves via magnetic cell sorting. The magnetic beads are conjugated to goat-anti-rabbit IgG (H+L) F(ab’)2 fragments (human serum absorbed,Miltenyi). With batch GR1525-6 I used to get around 90% pure Schwann cells (see picture). With batch -8 I have only 60-70% in the upper fraction and 30-40% other cells in the preparation. I can also confirm the results visually looking at the primary Schwann cell cultures afterwards where the batch 6- sorted ones were much purer than the ones from sorting using batch 8 but I don’t have % for this. Thank you for providing that extra information. I now understanf more fully what the customer is trying to achieve and the problems they have been encountering. As I mentioned in my previous email, the two lots used by the customer are from the same preparation of serum, they have simply been aliquotted at different times. You have clearly seen a marked difference in the activity of the two lots,it may be that the GR1525-8 lotsomehow lost some activity compared to GR1525-6 during theprocessing or delivery. This is uncommon and we have not had anysimilar complaints against this antibody. I would be happy to replace the GR1525-8 vial with a different vial. The only alternative to GR1525-8we have in stock is GR1525-7. As I said previously, this is from the same stock but is prepared at a different time. If you would prefer, I could send you an alternative antibody to the same target, such as https://www.abcam.com/p75-NGF-Receptor-antibody-NGFR5-ab3125.html. In order to organise this I will need the order number of the ab8874 (lot number GR1525-8). I look forward to hearing how you would like to proceed. New vial of ab8874 is staining cancer cells which don't express p75, while previous vial worked perfectly. Thank you for your call today and for letting us know about the trouble with this new vial of ab8874. As we discussed, I'm sending a free of charge vial on the order ***, which should arrive tomorrow. Please keep me updated about the results using this new vial.